QUESTION 1: "Which Insurance Company will give me the best rate???" QUESTION 2: "How much to insure a . . . ???" It's Spring time, and with the change in season comes thousands of new (or not-so-new) riders asking the familiar questions posted above. Myself and other members have patiently responded to the first of these inquiries, but quite frankly, it's a very boring topic that is repeated over and over and over again. If you are thinking of asking the second question, DON'T BOTHER -- other than the fact that it's annoying, you won't get any meaningful information on the forum. Instead, continue reading this post and contact the insurance companies I suggest, and they will answer that question for you very accurately. 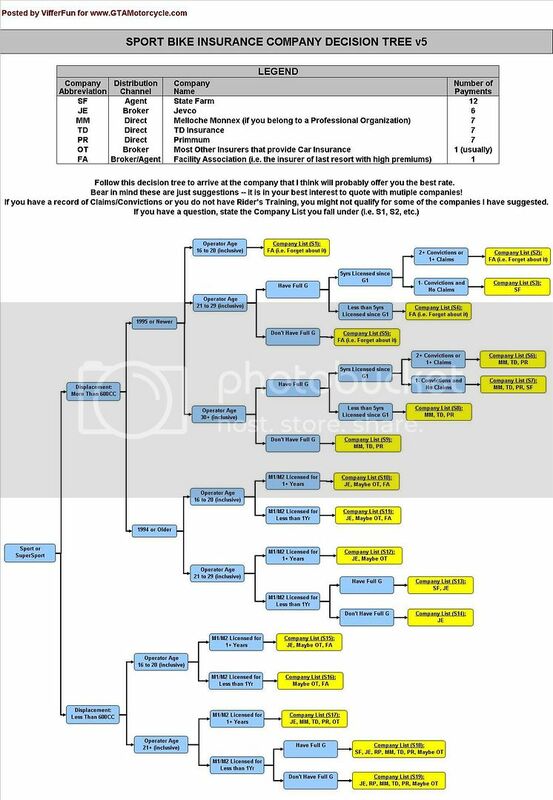 Before asking about the best Insurance Company, have a look at the decision trees that I have put together below. It's pretty simple -- follow the arrows and the tree will magically suggest some companies that might offer you the best rate. Be sure that you at least get a quote with each of the companies I suggest. You will notice that I suggest different companies depending on your profile, and this is because different companies desire different risks, and hence offer very different rates. I have created two decision trees . . . one for the Sport/Supersport riders, and one for the Classic/Cruiser/Non-Sport riders. Please keep in mind that this tree gives suggestions only, and it is also possible that your specific risk profile may not even qualify for some of the companies suggested. This is the large corporation actually providing you with the insurance coverage. The insurance company will reimburse you in the event of a claim. With the exception of Direct Writers, you do not communicate directly with the Insurance Company unless you are making a claim. This is essentially the "middle man" between the Insurance Company and you, the policyholder. A Broker can sell policies for multiple insurance companies, and it is their job to suggest coverage, explain coverage details, and match you with the best insurance company for your situation. A Broker is independent of the Insurance Companies they represent. It helps to quote with multiple brokers, since there are over 100 insurance companies in Canada, but each broker only deals with 3 to 10. A quote with the same Insurance Company by different Brokers will be identical if both Brokers are quoting the exact same coverages. Like a broker, this is the "middle man" between the Insurance Company and you, the policyholder. An agent is an employee of the company they represent, and they can ONLY quote with the company they work for. For companies that sell through the agency distribution model, you can only get a quote through one of their agents. The Agent's job is to suggest coverage and explain coverage details. A quote with the same Insurance Company by different agents will be identical if both Agents are quoting the exact same coverages. This is an insurance company that does not use Brokers or Agents. Instead of brick-and-mortar Brokers and Agents, you contact the Insurer directly for advice and quote through one of their call centres or their website. Enjoy the charts, and hopefully this cuts down on the meaningless posting in the Insurance forum here at GTAMotorcycle.com! nice post, you sure did spend a lot of time on this! I'm glad you used flowcharts now no one has an excuse to say "too long or confusing." I use them a lot when I teach, much easier to follow, good stuff! Just one thing. C1, riders 16-19. Riders Plus will not insure people under 25. Thanks for letting me know. 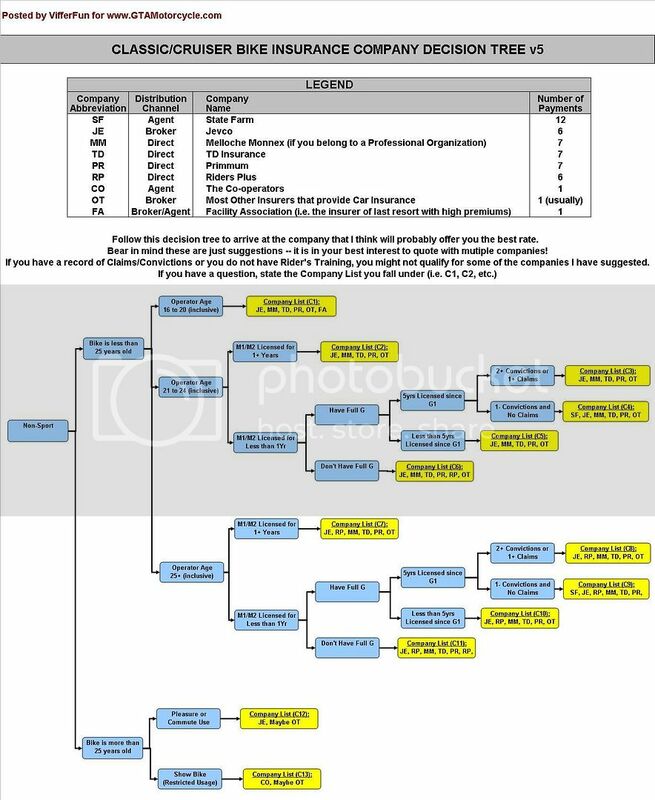 If anyone else knows any specific eligibility criteria for other insurers let me know, and I will adjust my flowchart sometime. 2.) Jevco will only insure someone aged 16-20 if they have held their M1/M2 for one year. If anyone knows of any other restrictions that I have missed, please let me know. that's really handy, thanks for posting!! FYI, I have added "Number of Payments" to the insurance company listings. Post a question and check in the morning to find this. .............then I realize, the answer was already here if I looked properly the first time and the response was a link to this thread. Yikes! I need a coffee. Hey. Great post. Thanks for taking the time. Very useful for us n00bs. BTW, 'Sport' ---> '< 600cc' ---> 'over 29yrs' -------> Error! so a how much difference 19 year old + a 1994 ex250 would be cheaper than a 1996 ex250 or will it be roughly the same? is there a 15 year and your bike will be consider into another class? I'd be willing to bet that its exactly the same. The 15 year old bike thing is more for former super-sports, as far as I know. Call a broker, lets not turn this thread into what its trying to prevent. The quote will likely be the exact same, especially if you aren't buying optional physical damage coverages (such as Collision and Comprehensive). There is no magic age where bikes become cheaper. The vast majority of your policy premium is to cover damage to your human body and liability to others on the road, and this risk doesn't decrease with the bike's age.